Ouch!! You cut your finger with a knife. Blood immediately starts coming out from the wound, and you freakishly search through your drawer for band-aid. However, way before you can find the band-aid, and even before the "Ouch" came out, just about the same time you sensed the pain, your body's self-healing mechanism was turned on. A multistep signaling cascade involving a dozen different proteins in the blood started immediately after the cut, calling for platelet cells to clog arround the wound and form a plug to stop the bleeding. How does our body sense a wound so fast? 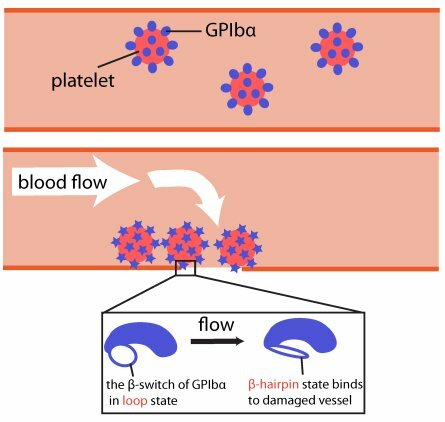 A possible answer is that the platelet cells carry on their surface a sensitive molecular flow sensor, a protein called GP1b, which senses erroneous blood flow caused by a cut in the blood vessel. It has been hypothesized that a small segment located on the alpha-subunit of GP1b, called the β-switch, transforms from a random coil to a β-hairpin in the presence of shear flow. 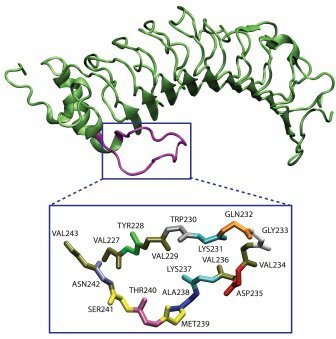 The β-switch, in its β-hairpin form, is able to bind to a protein called von Willebrand factor, which will then anchor the platelet to the damage site. To test this hypothesis, we found a way to generate water flow in our computer simulation, mimicking real blood flow, and studied the behavior of the β-switch under flow. In most molecular dynamics simulations, proteins or other biomolecules are placed in a small box of water with periodic boundary conditions, so is our molecular flow sensor. In order to generate constant water flow in a box like that, every oxygen atom in the water molecule within a 3Å slab at the left end of the box was pushed along the x direction by a constant force f. The pushing force started the water flowing right away. However, this method alone will also cause the flow velocity to increase continuously, and before long the water molecules will be moving so fast that the protein is essentially being cooked. Our simple solution to this problem was to couple a Langevin thermostat to every oxygen atom in the water molecule. By doing that, each water molecule was subjected at any moment to a damping force proportional to its velocity. The pushing and damping forces acting on the water molecules quickly reached a balance after the start of simulation, resulting in a nice uniform constant water flow. The velocity of the flow could by easily adjusted by changing either the applied force f or the damping coefficient of the thermostat. 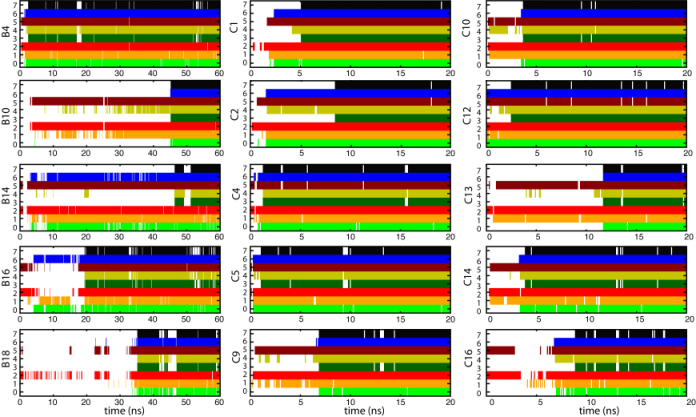 An extra bonus of using the thermostat for velocity control is that it also took care of the temperature at the same time, which is often a headaching issue in many molecular dynamic simulations. Steps towards β-hairpin formation. Click to view a β-hairpin formation trajectory. To transform from a random loop to a structured β-hairpin, the β-switch needs to form six hydorgen bonds between its backbone. Not only do the backbone hydrogen bond partners have to correctly find each other, but almost all the side groups will also have to be reoriented to their correct position and pack tightly against each other for the h-bonds to form. It is almost like opening a combination lock with a long long code-----you must get every number right, or you're stuck. How can something as simple as uniform water flow induce such a complicated conformational change in the β-switch? The answer, as we saw in our simulations, lies partly in the unique design of this tiny flow sensor, which allows it to perform the change in an ordered, stepwise manner, using the dragging force of the water flow. The flow-induced loop->β-hairpin transition of the b-switch was observed to happen in a stepwise manner consisting of two major steps, as schematically illustrated in the right figure. Shortly after the start of the flow, water molecules collided with the protein, dragging and extending the protein's backbone forward. Upon extension, the backbone dihedral angles were forced to rotate in the direction that increases the length of the backbone. The β-switch is connected to the entire GP1b protein in such a way that this rotation motion enables the potential backbone H-bond partners on the two opposite backbone segments to face each other. Moreover, side-groups rotated synchronously with the backbone. In several cases the backbone dihedral rotation caused some of the smaller side-groups to pass through the limited space between the two strands. Toward the end of this step, the backbone was fully extended and the orientation of all the side-groups were close to what they would be in the final β-hairpin state. At the same time, under the influence of the flow, the two strands of the β-hairpin started to rapidly approach each other allowing initially separated h-bond partners to come closer. In the second step of the transition, which immediately followed the first one, side-groups simultaneously searched for the right conformation to pack tightly with their nearest neighbors. 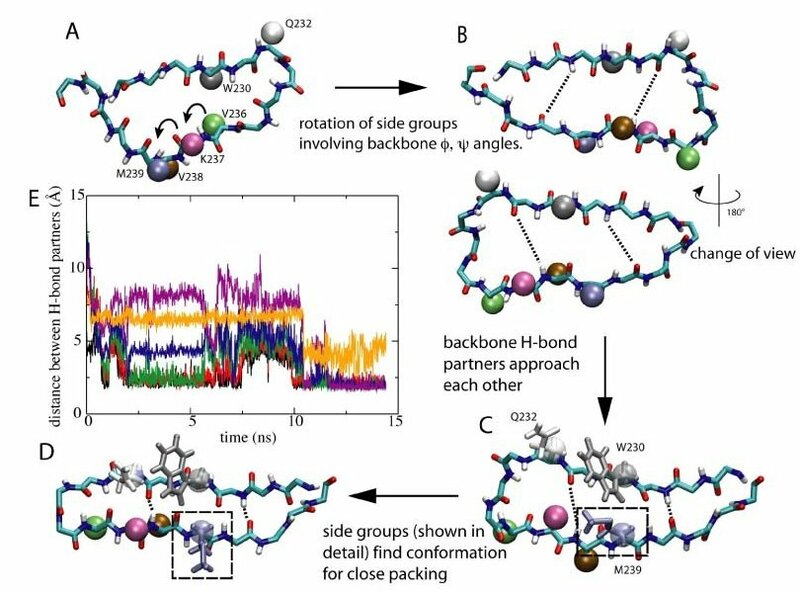 The tight packing of side-groups is critical to the formation of stable H-bonds, since it allows the H-bond partners to stay close to each other. Under the influence of the flow, pairs of side-groups remained close to one another during the searching process. This ensures that whenever the suitable conformations were found, the side groups quickly pack with each other, and the correcponding H-bond is likely to be formed right away. (A typical example is the packing involving bulky side chains of Met239, Trp230, and Gln232, which are highlighted in the right figure, C and D. ) Once tight packing was achieved for most of the side-groups, all six H-bonds were formed, and the transition to the β-hairpin was completed. The b-hairpin is a stable conformation under flow, and breaking of individual H-bonds after the formation of all six of them was never observed. What prevents spontaneous transtion from happening in the abscence of flow? Once we've understood the mechanism of the transition process, it seems that the unique design of the β-switch made the process relatively easy and automatic. One might worry that such an easy process will have a high rate of miss-firing, leading to unwanted blood clotting in healthy blood vessels. In fact, in reality, the rate of spontaneous transition in the abscence of flow is very low. The key to preventing miss-fire is entropy---- or the number of possible conformations for a given state. As observed in our simulations under equilibrium condition, the β-switch is extremely flexible in its loop form, and can adopt a large number of different conformations. In contrast, there is essentially only one acceptable conformation in the β-hairpin state. 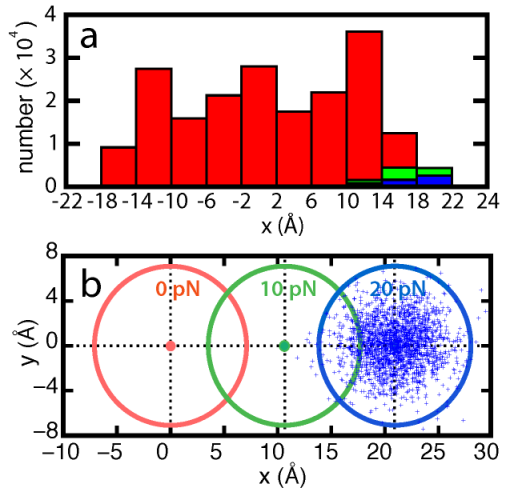 The large difference in the number of accessible conformations indicates a significant entropic difference between the two states. Therefore, without the guidance of a unidirectional flow, the β-switch will almost always be sampling different loop conformations, and never find the right path to form β-hairpin. It is just like trying to find the band-aid in your terribly unorganized desk drawer-----simply mission impossible. Lattice model and freely jointed chain model of the β-switch. β-hairpin folding mechanism. There are four residues (GLY233, VAL 234, ASP235 and VAL236) involved in the turn formation and three pairs of residues (VAL229-THR240, LYS231-ALA238 and GLY233-VAL236) establish five interstrand hydrogen bonds. Under 50~m/s-flow, the side chain packing happened first and was followed by interstrand hydrogen bond formation and G233-V234-D235-V236 (GVDV) turn formation. The folding pathway to the β-hairpin is similar in ten trajectories: side chain packing of residues located at the open end of the β-switch started the folding process; hydrogen bonds also formed from left to right; the GVDV turn formed after side chain packing was completed; the closed end hydrogen bond (236O-233HN) became established after GVDV turn formation, as the last step of β-hairpin completion. Under 25~m/s-flow, five simulations showed a similar folding pathway. Shown is the analysis of simulations at 25~m/s-flow (left) and 50~m/s-flow (middle, right). The properties represented by each row are: (0) native contact between residue VAL236 and GLY233 (close to turn); (1) native contact between residue ALA238 and LYS231 (middle); (2) native contact between residue THR240 and VAL229 (close to the open end); (3) hydrogen bond 236O-233HN (close to turn); (4) hydrogen bond 238HN-231O (middle); (5) hydrogen bond 240O-229HN (close to the open end); (6) turn formation; (7) five established interstrand hydrogen bonds (folded β-hairpin).
. Progress in β-hairpin folding under 25~m/s flow and 50~m/s flow. Flow velocity-dependence of hairpin folding kinetics. 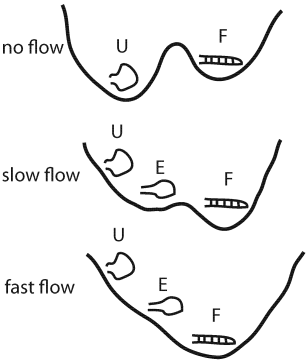 Flow exerts a dragging force on the beta-switch and causes backbone dihedrals to rotate in the direction that benefits β-hairpin folding. we calculated the distribution of β-switch length and number of interstrand hydrogen bonds using all twenty trajectories. The results showed that the speed of hydrogen bond formation increased with faster flow. 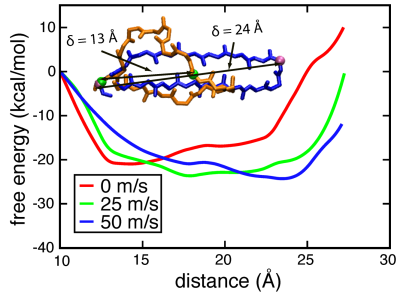 Flow velocity-dependent β-switch extension and interstrand hydrogen-bond formation. Interstrand water molecules. Water plays a major role in modulating the weak interactions in biological systems. In the case of β-hairpin folding, before hydrogen bond acceptor and donor from each chain approach each other, water molecules interact with the respective polar atoms, hindering interstrand hydrogen bond formation. When the β-switch adopts a loop state, the area between interstrands is large enough to permit a number of water molecules to be in contact with polar atoms. Under flow conditions, the β-switch is stretched in the direction of the flow, and as a result, the interstrand area becomes small, such that only a few water molecules can permeate through the interstand area. No interstrand water molecule is observed in a folded β-hairpin. Water molecules surronding the β-switch. Click to view a trajectory showing the movement of interstrand water molecules . Free energy barrier of β-switch. The potential, determined through adaptive biasing force simulations carried out at different flow speeds (0 m/s, 25 m/s, 50 m/s), shows a progressive stabilization of the β-hairpin geometry and a lowering of the free energy barrier separating loop and β-hairpin geometries. The change in energy can be attributed to a shift of the balance between entropic and enthalpic contributions. The results shown in the figure below exhibit three important features: (i) the free energy profile is clearly sensitive to the velocity of flow; (ii) the position of the free energy minimum moves towards larger extension with increasing flow velocity; (iii) increased flow stabilizes the free energy minimum connected with the elongated β-switch conformation. The results reveal that the free energy landscape of the β-switch has two stable conformations, loop and hairpin, imprinted on it, and flow induces a transition between the two. Schematic representation of the free energy landscape of the β-switch under different flow conditions. movie1_backbon.mpg (4.7MB): a trajectory of backbone rotation of the β-switch under flow condition. To clearly show how the backbone rotates, the frame rate is decreased when movie zooms into specific parts of the backbone. 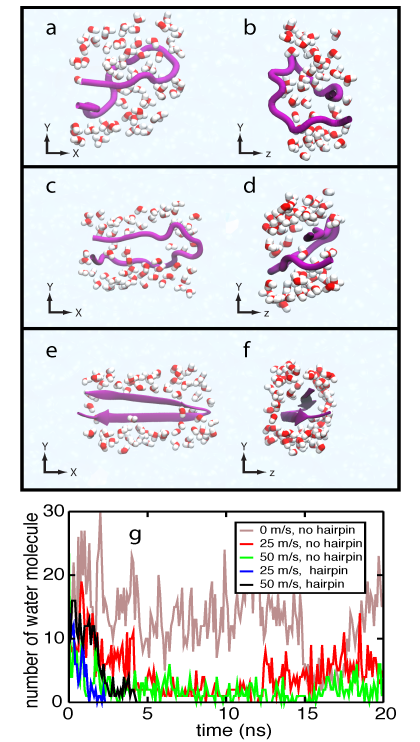 movie2_hairpin.mpg (5.1MB): a trajectory of flow-induced β-hairpin folding. Three steps involved in completing β-hairpin folding, namely, hydrophobic collapse (mauve), interstrand hydrogen bond formation (green) and turn formation (cyan) are highlighted. movie3_water.mpg (4.0MB): a trajectory of showing the decrease in the number of water molecules during β-hairpin folding. Due to the flow, water molecules are not stagnant, but differ in each frame, giving rise to apparently discontinuous jumps of water molecules from frame to frame. Flow induced structural transition in the b-switch region of glycoprotein Ib. Zhongzhou Chen, Jizhong Lou, Cheng Zhu, and Klaus Schulten. Biophysical Journal, 95:1303-1313, 2008. Flow-induced beta-hairpin folding of the GLycoprotein Ibalpha beta-switch Xueqing Zou, Yanxin Liu, Zhongzhou Chen, Gloria Ines Cardenas-Jiron and Klaus Schulten. Biophysical Journal, 99:1182-1191, 2010. Page created and maintained by Xueqing Zou. Contact Us // Material on this page is copyrighted; contact Webmaster for more information. // Document last modified on 07 Sep 2010 // 9599 accesses since 05 Aug 2008 .